Apply heating product to the heated surface ensuring 100% surface contact with surface to be heated. Plug heater into the controller’s output receptacle. Plug the controller into an approved power source using the Input power cord. 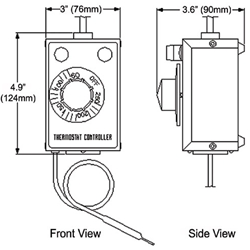 Rotate controller knob from the “OFF” position to the desired temperature setting.